"The Legend of Fyrebeard's Gold"
Steve Blease brings us an original and fun campaign framework for Strange Grogge, Wessex Games' black powder fantasy skirmish rules, designed for 28mm scale battles between Orcs, Dwarves, Elves and other popular fantasy races set in Panzerfäuste's realm of The Land two millennia before Alberich's jackbooted Dwarves swarm the continent. That he did not spend on ‘afling whores an’ leisure! Determined his loot not be found others an’ spent. A waterfall in front would protect it being traced. Thieves wouldn't dare, they'd be mauled! Nobody disturbed it, not even the most courageous. Maybe the once feared guardian, had now faded into mist. To venture through jungle for Fyrebeard’s gold?! That you hide under your sheets an’ stay in bed? The Legend of Fyrebeard’s Gold is a mini-campaign for Strange Grogge, it can be played solo or with friends. A GM might be useful but is not mandatory. 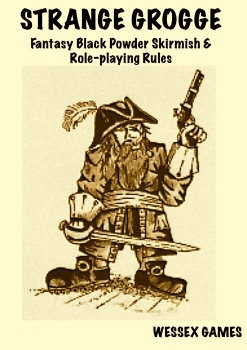 Inexperienced players should use the basic rules, but more fun will be had by playing the game using the role-playing rules. To run the campaign the players, along with the usual miniatures, dice and a selection of terrain, will need a snakes and ladder board with 100 squares. Square one represents the pirate freeport of Tõrquemârga and is the only square on which the pirate bands cannot attack each other. The rest of the board represents the jungles of the Môrgurinian Maine. All parties start the game on square one and each turn the players roll s D6 to decide who goes first, re-rolling ties. As you would in snakes & ladders you roll one D6 to see how many squares you advance. As in the kids games, ladders see you advance more quickly (your party discovers a hidden trail in the jungle), snakes see you fall back (you get lost). If a second party lands on an already occupied square they have the choice of fighting the first party. If they decide not to they “hide” and miss the next turn. From a terrain point of view, the battleground should be a 3 foot square table and unless specified below, the terrain a random mix of light and dense jungle. Once a player lands on a square they consult the following table. 1 - Tõrquemârga. All parties start the game in this wretched hive of scum and villainy. 2 - Jungle. No effect on progress. 3 - Light Jungle - roll D6 and move again immediately. 4 - Native Halfling Hunting Party. They don’t like you. 6 + D3 Halflings armed with spears attack you. 5 - Jungle. No effect on progress. 6 - Jungle. No effect on progress. 7 - Light Jungle - roll D6 and move again immediately. 8 - Secret trail. Move through to 31. 9 - Jungle. No effect on progress. 10 - Jungle Gorge. Unless you bought ropes or a ladder this route is impassable. Next urn you roll as normal but head backwards. 11 - Jungle. No effect on progress. 12 - Giant Jungle Wasps! Your crew disturb a next of giant wasps. Immediately roll a D6 again and move your party. Even rolls move the direction you where going. Odd rolls the opposite. 13 - Quicksand bog. Unless the party leader rolls a Critical Success finding an animal trail, spend D3 moves stuck here. 14 - Jungle. No effect on progress. 15 - Secret trail. Move through to 97. 16 - Jungle. No effect on progress. 17 - Jungle. No effect on progress. 18 - Rain Storm. Miss next move taking shelter from tropical deluge. 19 - Jungle. No effect on progress. 20 - Jungle. No effect on progress. 21 - Jungle with river. A critical success roll by the leader of the party will discover some native canoes, otherwise you must swim the 12 cm wide river. 22 - Jungle. No effect on progress. 23 - Light Jungle - roll D6 and move again immediately. 24 - Jungle. No effect on progress. 25 - Native Halfling Hunting Party. They don’t like you. 6 + D3 Halflings armed with spears attack you. 26 - Jungle. No effect on progress. 29 - Jungle. No effect on progress. 30 - Quicksand bog. Unless the party leader rolls a Critical Success finding an animal trail, spend D3 moves stuck here. 31 - Jungle. No effect on progress. 32 - Jungle. No effect on progress. 33 - Native Booze! Your crew stumble upon a stash of Native Hooch, You miss D3 turns whilst they drink it. 34 - Jungle. No effect on progress. 35 - Jungle. No effect on progress. 36 - Giant Jungle Wasps! Your crew disturb a nest of giant wasps. Immediately roll a D6 again and move your party. Even rolls move the direction you where going. Odd rolls the opposite. 37 - Native Halfling Hunting Party. They don’t like you. 6 + D3 Halflings armed with spears attack you. 38 - Light Jungle - roll D6 and move again immediately. 39 - Jungle. No effect on progress. 40 - Jungle Gorge. Unless you bought ropes or a ladder this route is impassable. Next turn you roll as normal but head backwards. 41 - Jungle. No effect on progress. 42 - Secret trail. Move through to 81. 43 - Missing. One of your party has become lost. Spend D3 turns looking for him. Unless the leader makes a successful roll, one of the party is removed. 44 - Jungle. No effect on progress. 45 - Rain Storm. Miss next move taking shelter from tropical deluge. 46 - Jungle. No effect on progress. 47 - Native Booze! Your crew stumble upon a stash of Native Hooch, You miss D3 turns whilst they drink it. 48 - Jungle. No effect on progress. 49 - Jungle. No effect on progress. 50 - Jungle with river. A critical success roll by the leader of the party will discover some native canoes, otherwise you must swim the 12 cm wide river. 51 - Jungle. No effect on progress. 52 - Jungle. No effect on progress. 53 -Native Halfling Hunting Party. They don’t like you. 6 + D6 Halflings armed with spears attack you. 54 - Jungle. No effect on progress. 55 - Wrong turn. The rail splits in two and you take the wrong one. Return to 13. 56 - Jungle. No effect on progress. 57 - Jungle. No effect on progress. 58 - Jungle. No effect on progress. 59 - Jungle Gorge. Unless you bought ropes or a ladder this route is impassable. Next urn you roll as normal but head backwards. 60 - Light Jungle - roll D6 and move again immediately. 61 - Jungle. No effect on progress. 62 - Quicksand bog. Unless the party leader rolls a Critical Success finding an animal trail, spend D3 moves stuck here. 63 - Jungle. No effect on progress. 64 - Missing. One of your party has become lost. Spend D3 turns looking for him. Unless the leader makes a successful roll, one of the party is removed. 65 - Jungle. No effect on progress. 66 - Secret trail. Move through to 87. 67 - Jungle. No effect on progress. 68 - Light Jungle - roll D6 and move again immediately. 69 - Baboons! Your crew disturb a troop of baboons. Immediately roll a D6 again and move your party. Even rolls move the direction you where going. Odd rolls the opposite. 70 - Jungle. No effect on progress. 71 - Wrong turn. The rail splits in two and you take the wrong one. Return to 29. 72 - Jungle. No effect on progress. 73 - Missing. One of your party has become lost. Spend D3 turns looking for him. Unless the leader makes a successful roll, one of the party is removed. 74 - Jungle Gorge. Unless you bought ropes or a ladder this route is impassable. Next turn you roll as normal but head backwards. 75 - Jungle. No effect on progress. 76 - Native Halfling Hunting Party. They don’t like you. 6 + D6 Halflings armed with spears attack you. 77 - Jungle. No effect on progress. 78 - Jungle. No effect on progress. 79 - Rain Storm. Miss next move taking shelter from tropical deluge. 80 - Jungle. No effect on progress. 81 - Jungle with river. A critical success roll by the leader of the party will discover some native canoes, otherwise you must swim the 12 cm wide river. 82 - Jungle. No effect on progress. 83 - Jungle. No effect on progress. 84 - Native Booze! Your crew stumble upon a stash of Native Hooch, You miss D3 turns whilst they drink it. 85 - Light Jungle - roll D6 and move again immediately. 86 - Jungle. No effect on progress. 87 - Jungle. No effect on progress. 88 - Wrong turn. The rail splits in two and you take the wrong one. Return to 67. 89 - Jungle. No effect on progress. 90 - Native Halfling Hunting Party. They don’t like you. 6 + D6 Halflings armed with spears attack you. 91 - Native Booze! Your crew stumble upon a stash of Native Hooch, You miss D3 turns whilst they drink it. 92 - Jungle. No effect on progress. 93 - Quicksand bog. Unless the party leader rolls a Critical Success finding an animal trail, spend D3 moves stuck here. 94 - Jungle. No effect on progress. 95 - Rain Storm. Miss next move taking shelter from tropical deluge. 96 - Jungle. No effect on progress. 97 - Whoops! You have ended up in a Native Halfling village! They don’t like you. 10 + D6 Halflings armed with spears attack you. 98 - Jungle. No effect on progress. 99 - Wrong turn. The rail splits in two and you take the wrong one. Return to 6. Once one party successfully discovers the loot, they need to make it safely back to Tõrquemârga, so play the game backwards. However landing on a snakes tail will result in your party being moved to where the head is and the top of a ladder is now the trail that leads to the lower square. Rival parties hear the hoots of celebration when the successful party discovers Fyrebeard’s loot and themselves head back towards Tõrquemârga in the hope of intercepting their rivals and capturing the lot from them. Strange Grogge is a set of wargames rules designed to allow you to play black powder fantasy skirmishes in a mythical realm with 28mm scale miniatures. Whilst they are set in a fantasy world, gamers will find that they can be used for straight black powder historical games, especially for those games inspired by the Hollywood version of history! Strange Grogge is set in the fictional world of The Land, and the history here precedes the events outlined in our mechanized fantasy warfare rules Panzerfaüste by some two millennia. Use of this background is however completely optional and players should feel free to use a totally different setting whether it be based on a film or book background, history, some other game system or one of their own invention, if they so wish. You can buy Strange Grogge right now over on Wargame Vault, currently discounted to a mere £2.50. If you don't own them, do yourself a favour and grab them now. This article was written exclusively for Orcs in the Webbe and was first published on the 19th December 2015 as part of its 2015 Advent Calendar.